vRealize Automation 7.3 has been released for a few months, but only last week I got time to update the lab and take a more serious look at it. And I really liked what I saw. One of the first features that I saw made me smile because I remembered the times when clients requested it and I was going through the processes of explaining that it is possible, but it will need some customization and some workflow development. Now, in 7.3 there are parameterized blueprints which allows to define t-shirt sizes for VMs, It also provides image parameters - how that image is being built. 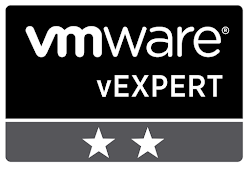 This way the configuration of the VM can be hidden from the service consumer and using image parameters organization policies can be implemented without the need to create new blueprints. You could have only one Windows template that provides 2012, 2012 R2 and 2016 as simple as selecting from a drop down menu. In the end, the user gets the possibility to select whatever OS version is entitled to and the t-shirt size of that deployment. Let's see how we can get to this nice item request screen. First we define the parameters. In vRA portal, go to Administration -> Property Dictionary -> Component Profiles. There are two component profiles already defined: Image and Size. Type in a display name (what the service consumer will see in the request form), a description (optional), configure the values for CPU, memory and storage and select the status (by default it is active and it can be used in blueprints). Press Save if you want to add more value sets or Finish to save and exit. Once a value set has been defined, it can be edited, deactivated or deleted. 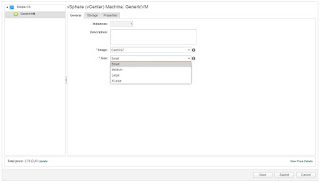 Type in the name display name, a description and then select how to build the VM. In my case, I've selected Linked Clone and filled in the necessary parameters: VMware template to clone from, the snapshot to use, customization specification name. All other options existing in a blueprint still available: create, clone, NetApp flex clone. Once we have defined the value sets and made them active, we can use them in blueprints. 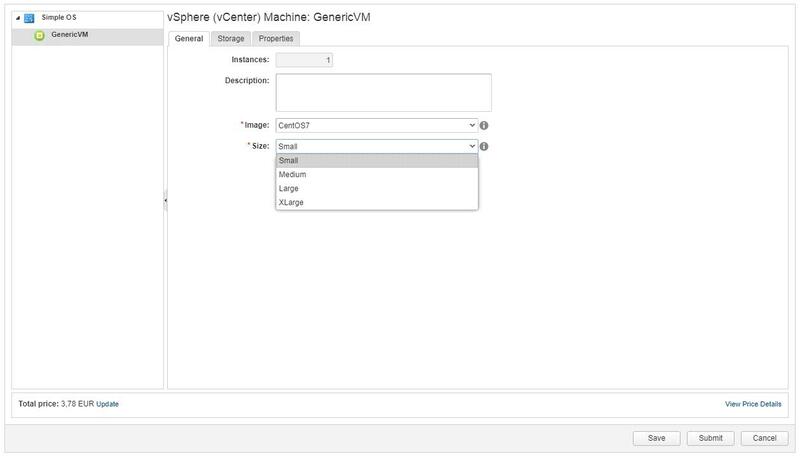 Go to Design - Blueprints - Edit, in the blueprint select the vSphere machine component and on the tab go to Profiles. By default, no component profiles are selected, press Add and select which component profiles to use: Size, Image or both. Press Finish to save and exit. Since the blueprint was already published, we can go directly to Catalog and request the Item using the new t-shirt sizes. For a new item, you need first to publish it, map it to a service and ensure the users are entitled to request the item.